Are there safety limits for 5G and radio waves? What do the experts say about 5G and health? What research into health effects has been done on 5G? Is the research on 5G, mmWave and health continuing? Will 5G devices comply with the safety guidelines? Is 5G safe for children? What about children wearing RF transmitting devices or wearables for security or entertainment? Will 5G devices automatically minimise transmitter power? Does 5G mean higher exposure levels? What types of base stations are used for 5G? Do 5G base stations automatically minimise transmitter power? What will be the size of compliance zones around 5G network antenna sites? Is 5G similar to active denial systems used by the military? 5G is the 5th generation of mobile networks, a significant evolution of todays 4G LTE networks. 5G is being designed to meet the very large growth in data and connectivity of today’s modern society, the internet of things with billions of connected devices, and tomorrow’s innovations. 5G will initially operate in conjunction with existing 4G networks before evolving to fully standalone networks in subsequent releases and coverage expansions. 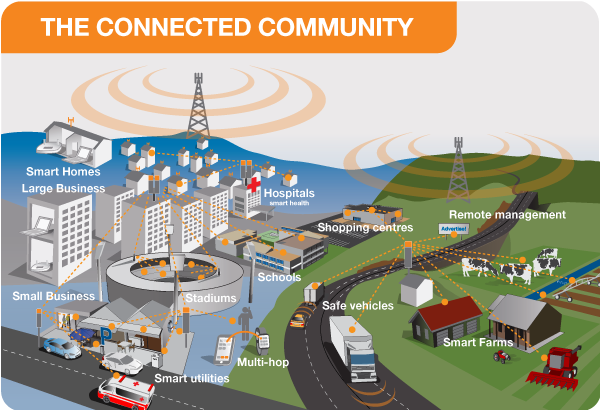 5G uses radio waves or radio frequency (RF) energy to transmit and receive voice and data connecting our communities. In addition to delivering faster connections and greater capacity, a very important advantage of 5G is the fast response time referred to as latency. Latency is the time taken for devices to respond to each other over the wireless network. 3G networks had a typical response time of 100 milliseconds, 4G is around 30 milliseconds and 5G will be as low as 1 millisecond. This is virtually instantaneous opening up a new world of connected applications. Yes. Comprehensive international guidelines exist governing exposure to radio waves including the frequencies proposed for 5G. The limits have been established by independent scientific organizations, such as the International Commission on Non-Ionizing Radiation Protection (ICNIRP), and include substantial margins of safety to protect all people against all established hazards. These guidelines have been widely adopted in standards around the world, and are endorsed by the World Health Organization (WHO). "A large number of studies have been performed over the last two decades to assess whether mobile phones pose a potential health risk. To date, no adverse health effects have been established as being caused by mobile phone use." The electromagnetic frequencies used for 5G are part of the radio frequency spectrum which has been extensively researched in terms of health impacts for decades. Over 50 years of scientific research has already been conducted into the possible health effects of the radio signals used for mobile phones, base stations and other wireless services including frequencies planned for 5G and mmWave exposures. The data from this research has been analysed by many expert review groups. Weighing the whole body of science, there is no evidence to convince experts that exposure below the guidelines set by the International Commission on Non-Ionizing Radiation Protection (ICNIRP) carries any known health risks, for adults or children. The EMF-Portal (www.emf-portal.org) is an open-access extensive database of scientific research into the effects of EMF, including studies on the effects of RF on health. It is managed by the RWTH Aachen University, Germany and linked from the WHO website. EMF-Portal contains more than 25,000 published scientific articles on the biological and health effects of EMF and 2,500 studies on mobile communications. In terms of research specifically on 5G frequencies, the database lists approximately 350 studies on mmWave EMF health related research. Extensive research on mmWave and health has been conducted on radar, microwave and military applications. Yes, the current research on mmWave frequencies is focused on the alignment of the human exposure guidelines at frequencies below and above 6 GHz where the measurement parameter changes from Specific Absorption Rate (SAR) below 6 GHz to Power Density above 6 GHz. For more on SAR see http://www.sartick.com/. The research is also focused on the dielectric properties of human skin to ensure that the power density levels and averaging area across the skin align with the temperature values that are the basis of the human exposure guidelines. For example, a mobile device operating at 5 GHz will be assessed for compliance by measuring the SAR. The SAR levels are set to limit the absorbed power so that the temperature rise in the head or body from the device operating at maximum power is below the equivalent relevant limit. If the same device was operating at 6.5 GHz, a power density measurement would be required, so the measurement parameters would need to ensure the same limit in temperature rise is maintained. 5G technology will be used in a wide range of devices and will be the backbone for the Internet of Things (IoT). All these devices will be evaluated to ensure that they conform to the RF safety limits adopted by agencies around the world. Yes. The EMF safety limits cover the 5G frequency range and include substantial margins of safety to protect all people including children from all established hazards. The radio transmitters in such devices are generally transmitting with very low power. When tested they are required to comply with national or international exposure limits. When watching a video the device is mostly receiving information and only transmits information for brief periods. Other types of devices such as personal trackers also transmit for short periods of time. Yes. 5G devices will automatically minimise the transmit power to the lowest level in order to complete a satisfactory communication with the network. Such automatic power control has existed in previous generations of mobile technologies (2G, 3G and 4G) and helps to minimize interference, prolong battery life and also has the effect of limiting the EMF exposure of the user. The transmit power of the device is controlled by the network. DOES 5G MEAN HIGHER POWER AND HIGHER EXPOSURE LEVELS? No. 5G networks are designed to be more efficient and will use less power than current networks for similar services. With the introduction of new technologies, there may be a small increase in the overall level of radio signals due to the fact that new transmitters are active. In some countries deployment of 5G may occur as part of closure of earlier wireless networks. Based on the transition from previous wireless technologies we can expect that the overall exposure levels will remain relatively constant and a small fraction of the international exposure guidelines. Base stations used for 5G will consist of various types of facilities including small cells, towers, masts and dedicated in-building and home systems. Small cells will be a major feature of 5G networks particularly at the new mmWave frequencies where the connection range is very short. To provide a continuous connection, small cells will be distributed in clusters depending on where users require connection and this will complement the macro network 5G base stations. 5G networks will work in conjunction with 4G networks. In many cases, existing 4G base stations will be used for additional 5G equipment. Yes. 5G networks are specifically designed to minimise transmitter power, even more than existing 4G networks. 5G networks use a new advanced radio and core architecture which is very efficient and minimises transmissions consistent with service requirements which results in optimised EMF levels. The network also controls the power level of the device to the lowest level in order to complete a satisfactory communication with the network. The technical standards for the 5G networks and devices are still under development however it is expected that the size of the compliance zone for 5G antennas will be similar to that of other mobile technologies using similar transmitter powers. Mobile network antennas are typically directional. Compliance zones extend in front of the antenna and a small distance above and below. Mobile networks are designed to use only the power needed to provide quality services. Too much power would cause interference and affect all users. One of the goals of 5G is a substantial increase in network energy efficiency. Where 5G is added to an existing site with other mobile technologies, the existing compliance zone may increase due to the addition of the 5G technology however this will depend on the site design and network configuration. IS 5G SIMILAR TO THE ACTIVE DENIAL SYSTEM USED BY THE MILITARY? No. Active Denial Systems developed by the military use very high powered mmWave directional signal, sometimes called a ‘heat ray’ in the 90 GHz band designed to heat the surface of targets such as the skin of a human, and through the heat, control or restrict access. 5G and other mmWave radio communications use different frequencies and a fraction of the power. The human exposure limits for mobile communications technology prevent heating occurring.